Pawn your Ulysse Watch with Us - We offer Loans on Ulysse Watches! If you’ve been wondering “can I pawn my Ulysse Nardin watch in London?”, the answer is yes – at New Bond Street Pawnbrokers you can. We offer loans on Ulysse Nardin watches at out award winning shop in Central London, and you could even receive funds on the same day. Simply make an appointment with our appraisers and allow us to value your watch for free. Ulysse Nardin is a Swiss-based firm which has been producing luxury timepieces since 1846. To date, it has produced five collections – Marine, Diver, Classico, Executive and Freak, alongside rarer limited edition collector’s items, such as the Ulysse Nardin Sonata Cathedral, which can fetch up to £17,200 at auction. How much could your Ulysse Nardin watch be worth? 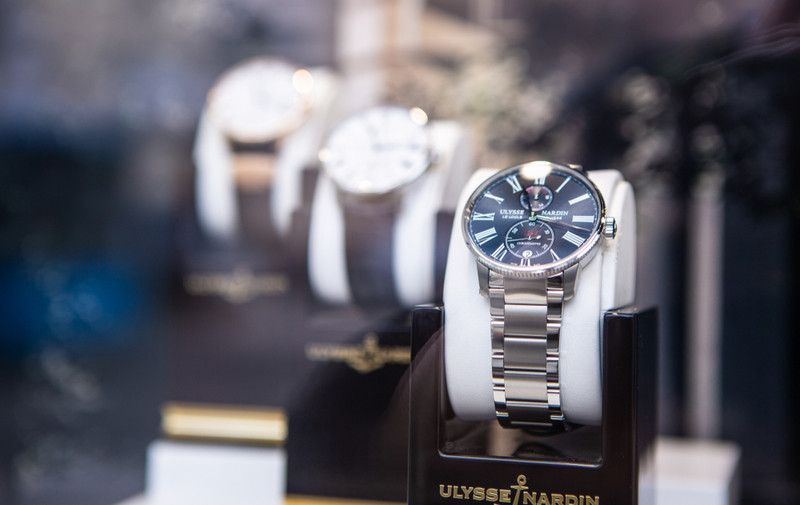 Ulysse Nardin is well-known for producing luxury watches. Precision engineering and impressive design credentials combine to create stately timepieces. Limited edition models like the Ulysse Nardin GMT-Master II can fetch £60,000 at auction, whereas standard items like the Marine and Diver models can command a price tag of £10,000. Because Ulysse Nardin watches are so revered, they tend to hold onto their value (and in some cases appreciate in value) as time goes on. What condition is your luxury watch in? The aesthetic and mechanical condition is incredibly important when it comes to securing a loan on a Ulysse Nardin watch. Scratches, dents and mechanical faults can all drastically lower the value of a luxury watch, although minor mechanical issues which are easily repaired might not affect the price too much – our appraisal team will be able to provide you with more information upon inspection. If you’ve been wondering “what documentation should I bring to pawn my Ulysse Nardin watch?”, the answer is quite simply everything you can find. Certificates of authenticity, proof of purchase receipts and any repair documentation you have could increase the value of your item. Provenance is important. Does the age of your watch matter? As time goes by, older models tend to get lost or damaged beyond repair, therefore reducing the amount of them in circulation. Naturally, this tends to result in an increase in value. However, because Ulysse Nardin watches are so impeccably engineered, even brand new models (such as the 2019 Freak series) can raise £10,000 at auction.